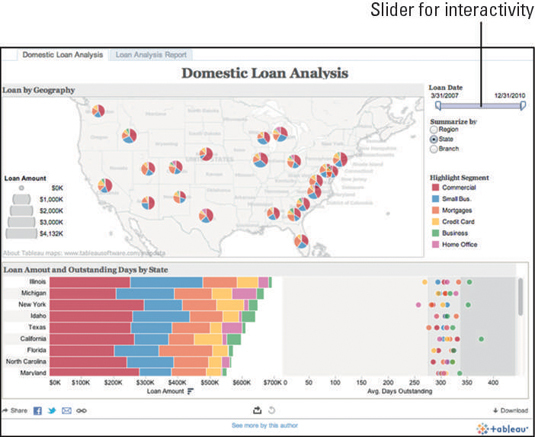 In this example, the following figure shows a dashboard that analyzes the status of domestic loans in the United States. The original image can be viewed here. Color consistency: One thing that’s evident throughout this visualization is the consistency of the colors in the dashboard. 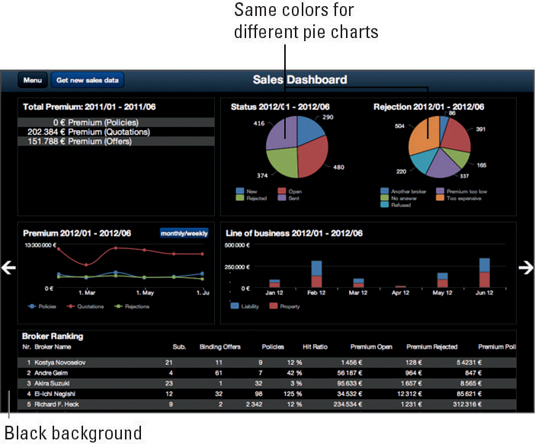 On the right is a single legend — Highlight Segment — that shows the legend for the color, which remains in both the bar chart at the bottom and the pie charts on the map. Simplicity: The two large charts make digesting the data easy. Interactivity: The slider in the top-right corner controls the time period displayed on the charts. That interactive feature put users in control of what they view. Chart choice: The small pie charts that are overlaid on the map are of little value. They’re hard to view, and without clicking every single one, the user can’t determine which of them are worth evaluating. It’s also virtually impossible to tell which states or regions the charts pertain to. Color choice: The abundant use of red, blue, and orange are misleading, especially in the stacked bar chart at the bottom of the data viz. At a glance, users may think that the colors could mean good versus bad; in fact, they’re just associated with a specific segment. This type of color usage harkens back to the recommendation about being careful with the use of RAG colors. An alternative is to use more muted colors, such as a range of grays and blues. Data overload: There’s a lot of data on the screen, but none of it really identifies the most important data or trends that users need to pay attention to. This visualization displays data for viewing instead of adding real value. 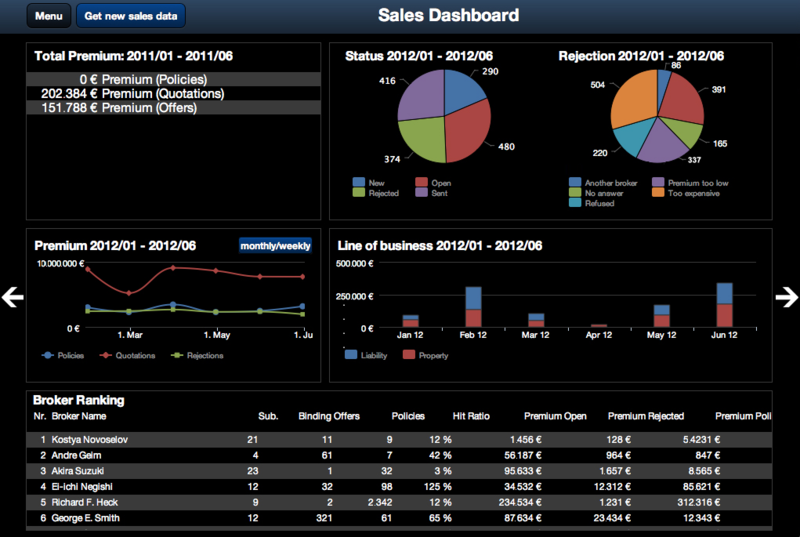 This figure shows a sales dashboard from a popular blog that displays high-finance charts. You can see the original dashboard here. Unfortunately, there’s not much in this data viz that works very well. Color choice: Black backgrounds are tricky. Many beginners use a large dark background to make the charts stand out. Over time, however, most users get tired of the dark background, and if they have to print the data visualization, this background is surely a great waste of ink. Avoid using black or very dark backgrounds throughout a data viz unless you can overlay each section with a much lighter color. Chart choice: The Status pie chart on the left has four almost-equal slices and tells the user absolutely nothing. Using an ascending bar chart would make the small change in the values more evident. Chart choice: The Line of Business bar charts are tiny and hard to read. Moving the Line of Business column charts to where the line charts are currently located and increasing the height would allow more of the values to be shown. Presently it looks like it just got stuck in the corner. The figure below shows a data visualization that displays sales by geography. Note that the following things work well and things that don’t work apply to both the tablet and phone versions in the figure. Chart choice: The bullet charts on the left tell a clear story about how the products are selling. Location intelligence: The use of proportionally sized, brightly colored circles on each country makes this display fairly easy to digest. 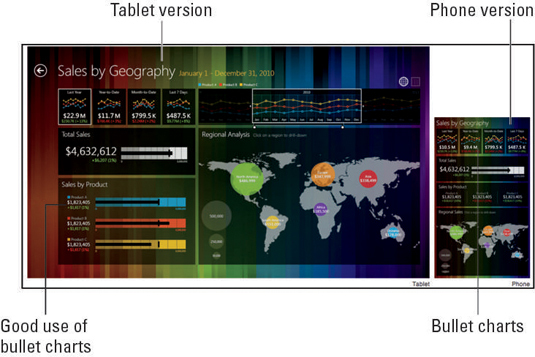 Mobile viewing: A great feature of this data viz is that it shows you how it will look on mobile devices. You can see a consistent layout in the two versions. Color choice: The striped background colors are distracting. The spectrum of colors attracts users’ attention, but in the wrong direction: away from the data. A solid background would be better. Chart choice: The four micro line charts on the left, which show some sort of trend, add no value. Can you tell how Sales Last Year is trending by looking at the lines? Removing the lines and just displaying the numbers in large text would be much more effective. Also, the map uses a large amount of real estate compared to the value it adds.